We are loving all the fashionable and adventurous elements we're seeing in women's flats these days. What they are lacking in heel height, they are making up for it with cool colors, textures, patterns, and fabrications. We've always been a fan of Luichiny and we absolutely adore this colorful Luichiny Lucky Girl Oxford. The eye-catching, menswear-inspired style features a bold paint splatter, printed fabric upper, adjustable laces with metal eyelets, a rounded toe, white stitching detail, and a comfortable 3/4" heel, perfect for walking the city. 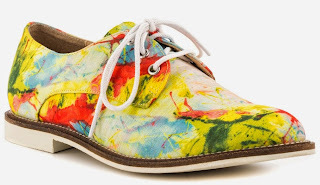 Grab this abstract design, along with other colorways, for $59.99 on zappos.com.